I have only had one Fish Pedicure Treatment and it was an experience! (I will do a full review if anyone is interested - let me know in the comments) At the time I questioned how hygienic it was since there were a few DEAD FISH floating at the top of the tank. I am not overly keen on feet at the best of times and didn't like the idea of putting my feet in a tank full of water (and nibbling fish!) that other people's feet had shared, however, salons say that they use UV Lit tanks to filter the water and keep them clear of disease. Since then, I have been disgusted by reading several articles about how these fish pedicures can spread diseases as hygiene levels are below standard in some salons and the water is not regularly changed in the tanks. 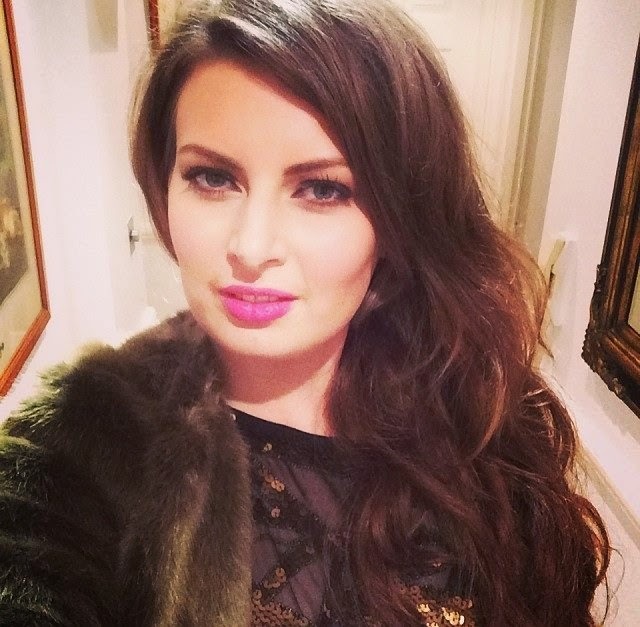 Experts are worried that this latest beauty craze can spread infection and disease rapidly which has prompted a health warning and The Health Protection Agency are investigating. The treatment has already been banned in 14 USA States. 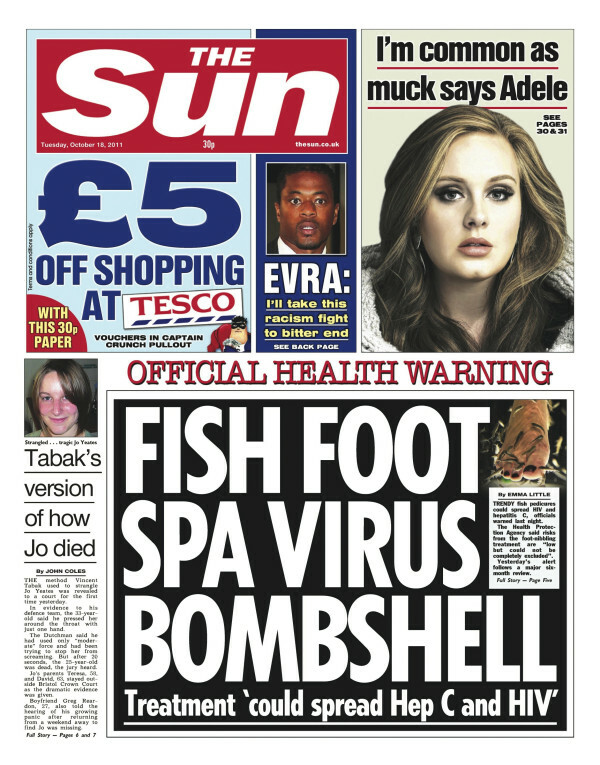 Today I was horrified to see that the front page of The Sun Newspaper reads that this Fish Spa Treatment can spread Hepatitis C and HIV Viruses! Have you had a Fish Spa Treatment? What were your thoughts? Let me know below if you would like to read my experience or link me to yours if you have a review! I'd love to read a full review! Sounds interesting! I'm sure there ARE well run, hygienic ones but I often pass one in a local shopping centre and it looks dirty and shabby - customers aren't even provided with somewhere to wash their feet before putting them in the tank. I often worry about the animal welfare aspect too - the tanks of fish seem overcrowded and neglected, as well as being forced to survive on eating dead skin off human feet, something I'm sure they aren't programmed naturally to do in the wild. If they were cuddly and fluffy rather than slimy and wigglyI'm sure there would be an outcry about it! I'm going for one today and have read the reports and it doesn't put me off at all. I go to local swimming baths 4 times a week and that's hardly hygienic either, prob less than fish spa, walking around where others have. The headlines are so bold then inside states it's only a very low risk unless got cuts to skin. If I had cuts I wouldn't go plus the place I go has very strict checks n cleaning procedures. Oops, I guess I'm not gonna try it now after have seen this... :( but let's be clear, I wasn't willing to either, I think I cannot stand it! I don't know if this just sounds lame but I kind of feel a bit sorry for the fish! What do they eat in the wild?! I bet it isn't skin from human feet that's for sure. Having said this, if I see dead fish in my fish pedicure session, just too bad. I'm never gonna return to that spa! I have had a treatment... It was an experience but it didn't really do much to the skin on my feet, I have seen and read that article in the sun and I have also heard it on the news on the radio, and I must admit it has got me a little scared and worried... It was a good experience however, I just wish that it wasn't the case that disease could possibly be spread. I don't think so as its been naturally carried out , ya these must be possibility that is fish spa suits to your skin that can be taken into consideration. I enjoyed every bit of your article. It is very informative and helpful to me as well as to all the commentators. Thanks for taking the time to discuss on this. I will love to read more from you.